Fiber optics could potentially change how we approach AV technology. For decades, we have relied on copper cables to do everything from our internet to many kinds of AV technology. 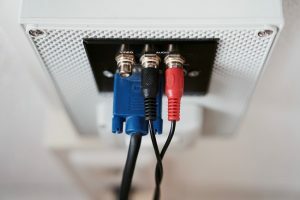 Coax, S-video, and HDMI cables have all been standards are one point or another and take advantage of copper cables carrying the electrons and signals of these devices—and their benefit is just how easy they are. Plug them in and they’re ready to go, not to mention you can’t go much cheaper than copper. Now, though, we’re looking at how fiber optics might be able to shake up our typical means of AV signal distribution and what that could mean in the future. We’re seeing big jumps in data rates (think bandwidth) but that doesn’t mean copper cables are physically able to transmit all of that data. With copper cabling, there’s a limit on distance you can go before you begin to see a huge number of errors in the signal. If we take a baseline of 100 feet, fiber optics are capable of transmitting more than 100 times what copper cabling can do, allowing us to keep up with ever-increasing data rates. Compared to copper, fiber optic cables are half the width and a fraction of the weight of even high-end copper cables. Some kinds of fiber can be up to 10 percent the size of copper cables and the jacket can even be translucent, making for nearly invisible fiber—a big benefit to those of us who have a keen eye for how we set up our AV equipment. Simply put: fiber optics are more secure than traditional copper cables. While most of the focus on adapting fiber optics has been placed on performance, there’s no denying that security is a big concern for many of us in the digital age. Electromagnetic interference can come as a result of other electronic systems disrupting one another or even other channels in the same cable. This makes taking advantage of copper over long distances difficult, but light waves over fiber are immune to this kind of interference, so fiber becomes far more secure, even at longer distances and improved bandwidth. It’s no wonder why fiber optic installations have become more and more prevalent. This entry was posted on Friday, July 27th, 2018	at 11:24 am	. You can follow any responses to this entry through the RSS 2.0 feed. Both comments and pings are currently closed.